It's funny how it goes. Spring has hit with a visual thunderclap, the sun has played central stage for a few heady days and perky male birds are intent on luring a harem of quietly coloured females with their exquisite serenades. Despite this delightful spectacle assailing my senses I have been feeling quite melancholic. Nature always has the final word, you will agree, and so I have tried to accept this temporary state of mind as gracefully as possible. Wandering the countryside has raised my spirits, of course. The fruit trees are proudly displaying their finest garnments and as my eyes travel upwards in wonder I tell myself that never before have I seen such an opulent display of blossom. I also thank my lucky stars that, unlike my eldest daughter Héloïse, I am not allergic to pollen: it's going to be a potent time for hayfever sufferers this spring. My sadness is no more than a good dose of nostalgia, I beIieve, following a full day in Paris after dropping Héloïse and Tristan off at the Gare du Nord. An afternoon spent soaking in the beauty of the Palais Royal arcades and gardens on a glorious spring day whilst recalling years of happy memories in this city left me feeling foolishly wistful. 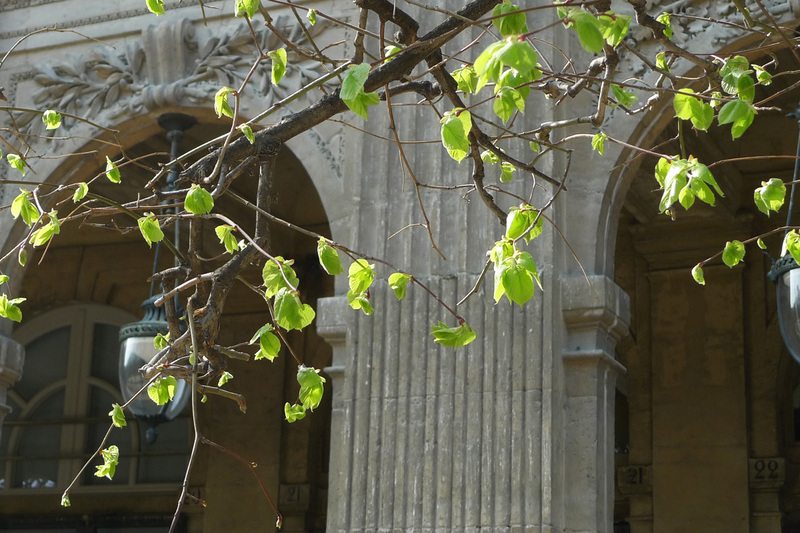 Have you ever been to the Palais Royal? The peaceful gardens, nestled amongst seventeenth-century architecture and a stone's throw away from the Louvre Museum, are quite enchanting. Prior to the French Revolution, Louis-Philippe Joseph II Duc d’Orleans, King Louis XVI's cousin, had turned the Palais Royal into the place to be in Paris. The gardens were crowded both day and night. Café tables and chairs spilled out into the gardens at all hours. Circus acts and street performers entertained the crowds. Parisians as well as visitors from the provinces and abroad came to the Palais Royal to shop, gamble, drink, mingle, and discuss the ideas of Enlightenment philosophy without threat of censorship or imprisonment. Perched on a straight-backed iron bench that afternoon last week I observed the present day gardens. 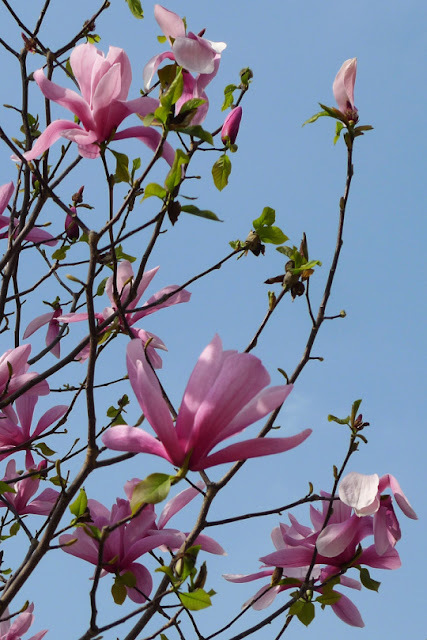 The linden trees with timid leaves unfurling - as seen in the first picture above - hopping sparrows, and lusty magnolias sporting the most stunning pink blooms I have ever seen. Within the cloistered lawns crowds of delicate narcissi jostled for attention alongside bonbon pink tulips and blue hyacinths. There was birdsong everywhere and around the exuberant central fountain people sat, their faces uplifted to catch the sun with bare feet and blissful smiles. Gaggles of children whispered and giggled behind clipped round boxtrees enclosed in celadon painted wooden containers whilst their parents gossiped and chastised. There were sweet girls with cropped haircuts and petal pink dresses and knits scuffing their shoes in the dust. These little girls were the inspiration behind Celestine Mouse, my latest creation. She reminds me of the old-fashioned toy shops hidden in the arcades surrounding the gardens. Her dress is so very French as are her pantaloons stitched from 1900 hand-embroidered tulle and trimmed with handmade lace. I made her in rememberance of bygone times still present in such places as these gardens which are suffused with social history. Content though Celestine might be playing in central Paris she is even happier lying in the grass in our garden and looking up through the branches of our cherry trees. And because sewing makes me happy and soothes my nostalgic heart I decided to make this little mouse another dress from Liberty fabric trimmed with 1940's lace. If you would care to take a closer look at Celestine - and her two dresses - she may be found here, patiently twiddling her thumbs and dreaming of bygone days in Paris. Thank you so much for taking the time to read my (self-indulgent) words, wonderful readers. I am a little curious to know whether you too suffer from bouts of nostalgia? Sweet violet season is drawing to a close in our neck of the woods. Their first blooms in February demurely gracing our hedgerows and the shady outskirts of our neighbouring vineyards fill me with a quiet joy which whispers 'spring'. How do I know they are sweet violets (Viola odorata) and not the tinier dog violets (Viola riviniana)? Unlike their small cousins, the dog violet, which has no smell, these little beauties have that unmistakable perfume; the most elusive of all fragrances. There have been abundant clumps of purple this spring - perhaps due to the equally abundant rainfall - and, soggy ground permitting, I have got down on my hands and knees to sniff. Did you know that violets get their ephemeral scent from ionone? After stimulating scent receptors, ionone binds to them and temporarily shuts them off completely. This substance cannot be smelled for more than a few moments at a time. Then, after a few breaths, the scent pops up again. Because the brain hasn't registered it in the preceding few moments, it registers as a new stimulus. As magical as an illusionist's trick. This year violets have been popping up, as if by magic, everywhere in our back garden. I simply felt I had to do something with this unexpected crop and turn the elusive violet into something more enduring. I gently ground, as suggested, 40g of violets with 200g of sugar with a pestle and mortar, spread the purple sugar onto a paper-lined baking tray and let it dry overnight. Sprinkled over fromage blanc, pancakes, waffles, meringues, and my favourite rice pudding, this sugar suffuses us for a few moments with nostalgia. If the scent of violets is ethereal it can be equally difficult to capture the colour violet on camera. My passion for violets compelled me to purchase some delectable yarn from The Uncommon Thread in the Viola colourway and knit something simple and a little old-fashioned for our sweet Angélique. Do you see those adorable mother-of-pearl buttons, found at La Droguerie in Paris during a wonderful day last week? They have tiny violets engraved on them. The pattern is Granny's Favourite. This is my first Georgie Hallam pattern. I was slightly taken aback when I saw sixteen pages printing off but I hasten to add that it is a perfectly wonderful pattern to follow; a delight to read with its colour-coded size instructions. Granny’s Favourite - we are talking Little Red Riding Hood’s Grand-mother of course - can be knitted with short, middle-sized, or long sleeves which makes it sound a little like Goldilocks And The Three Bears! My Ravelry notes are here. I am delighted to announce that the winner of my French harp music giveaway is An Cailin Please email me your postal address so that I may send it off to you I just know that it will make your heart sing. "Denise stood transfixed ... this shop which had suddenly appeared before her, this building which seemed so enormous, brought a lump to her throat and held her rooted to the spot, excited, fascinated, oblivious to everything else. The high-plate glass door, facing the Place Gaillon, reached the mezzanine floor and was surrounded by elaborate decorations covered with gilding. Two allegorical figures, two laughing women with bare breasts thrust forward, were unrolling a scroll bearing the inscription "The Ladies' Paradise"." Emile Zola, The Ladies Paradise, translated by Brian Nelson (Oxford World's Classics), p.3. This is an extract from one of my favourite books, Au Bonheur des Dames, first published in 1883 which is also, incidentally, the year of Coco Chanel's birth. For those who are not familiar with this novel it traces the creation and rise of the department store and the love story of provincial Denise Baudu with the hugely wealthy shop owner, Octave Mouret. It is, as far as I know, one of the few Zola novels to end happily. It is also a fascinating read which delves into the social history of mid-nineteenth century Paris and is teeming with fascinating descriptions of innovative retail techniques and fashion. I love it and have until now hesitated to watch last year's BBC adapted series The Paradise. Have any of you seen it? If so, did you enjoy it? or the first time on the "endless spectacle" of The Ladies' Paradise shop window. This may simply be a department store but the marvel she feels matches my own about Paris in general. Like humble Denise I often feel "a lump in my throat" as I wander the city's streets. I may have lived there for a few years, chased metros, blundered past pedestrians on dirty pavements on my way to work and experienced week upon week of public transport strikes, nothing can diminish my love for this city. Every street corner offers the possiblity of a chance encounter and a flash of beauty. Please don't laugh at me for I have decided to create a series of mice - and dolls too - named Les Parisiennes. Please meet the two sisters ; Hortense and Angelina. For more than a century, the tea room, Angelina, has been a celebrated Parisian address for gourmet pleasures in the heart of Paris on the rue Rivoli a couple of minutes stroll from the Louvre museum and across the road from the Tuileries gardens. The decor, by the famous belle époque architect Edouard-Jean Niermans, mixes elegance and charm. Angelina is still famous for its hot chocolate and Mont Blanc whose centuries-old secrets remain well-kept. It also happens to be a favourite haunt for these two mice! Angelina Mouse adores to dress in her finest clothes, eat chocolate cake and sip tea at Angelina's. She usually invites her sister Hortense to come with her. Hortense culitvates violets in her small Parisian garden and always carries the elusive scent of violets with her. After tea she encourages Angelina to accompany her across the rue Rivoli to walk in the beautiful Tuileries gardens to admire the parterres of flowers and watch the children chasing hoops and laughing on the colourful merry-go-round. I have had so much fun making these little ladies over Easter. Handmade lace, 1900's hand-embroidered tulle, vintage fabric and buttons made this a wonderful week for me. There were a few French chocolate eggs to hand too although I kept my fingers clean, mostly! These creatures are longer limbed than my hares and measure almost 18" tall. The idea behind them is that I will have that much more freedom to make them more clothes: consider them models of some sort :-) I am hoping to be more adventurous with my themes. These two are fairly tame! As I type these words in the early hours of the morning I notice that Angelina has been whisked away - perhaps by a galant Pariisan gentleman mouse? 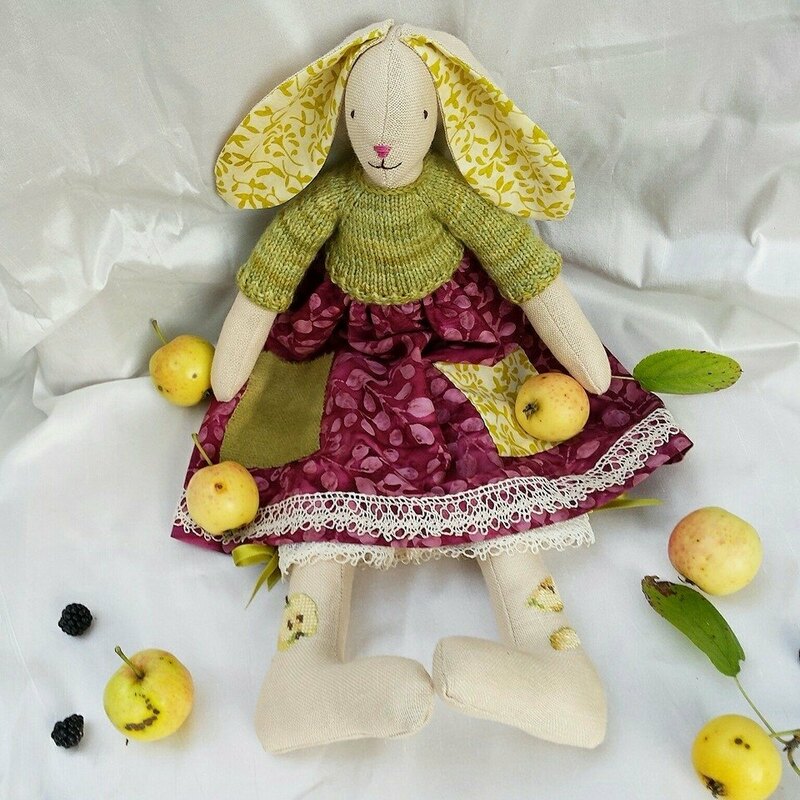 If you would like to take a peek at Hortense you may find her here. Please don't skip off just yet! I would like to share a little gift with you in order to celebrate my first Parisian mice. A few weeks ago I purchased a CD for Tristan and we have had so much pleasure listening to it that I decided to order an extra copy for one of you. French nineteenth- and twentieth-century composers. What could be more apt? It is the most exquisite harp music. Le Jardin Féerique or The Fairy Garden. If you interested in this recording please just leave me a comment below and, if you are new here, it would be marvellous if you could become a follower of my blog. If you feel compelled to spread the word about this little giveaway just come back and let me know so that you may have two chances to win. I will announce the winner on my next post.